Aim: The purpose of this study is to critically evaluate the factors that affect the bond strength of one-step and two-step self-etch adhesives by using meta-analysis. Materials and Methods: Potential papers that were selected according to inclusion and exclusion criteria from articles were published in 13 peer-reviewed journals using "PubMed data base". From each report, means and standard deviations of bond strengths were extracted and tabulated with corresponding experimental conditions. Results: All the studied parameters showed no significant difference, except for dentin origin/site and bonding area. In addition, statistical analysis done with ANOVA showed statistical significance between the one-step and two-step self-etch adhesives. Conclusions: Our analysis has showed that two-step self-etch adhesive system showed a superior in vitro performance in comparison to one-step self-etch system. Nevertheless, certain factors such as dentin origin, site and area of bonding affect the bond strength of adhesives. Aesthetic restorative materials have gained considerable importance over a period. Bonding to enamel is been considered satisfactory, but adhesion to dentin is much more complex due to the nature of the substrate. The best way to test the effectiveness of a biomaterial, as well as composite or luting cement or a bonding system, is in vivo experimentation in controlled trials. However, it is quite impossible to distinguish by clinical evaluation and adhesion potential of a dentin-bonding system from many other parameters that influence either the quality or the longevity of a restoration. Several authors have already studied the influence of some of these factors, such as the origin of the substrate,  substrate storage,  dentin depth,  type of composite,  testing mode,  etc. 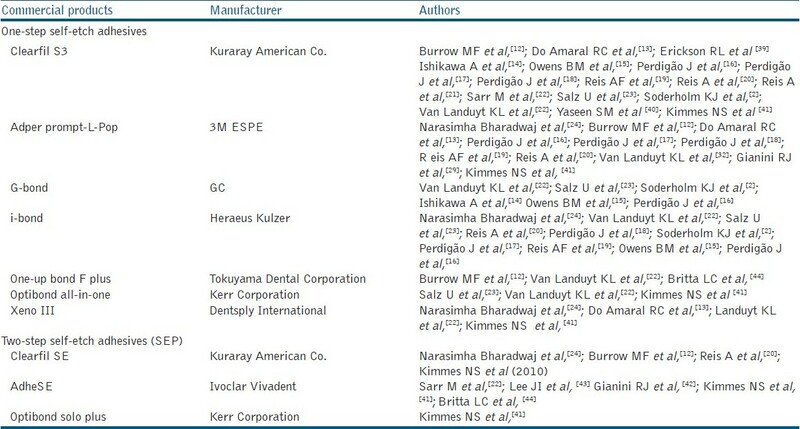 Some previous reviews have listed most of the variables influencing dentin bond strength,  but none has quantified their importance or defined their statistical significance. The purpose of this study is to evaluate the true factor that affects the bond strength of one-step and two-step self-etch adhesive. This quantitative overview could be considered as a meta-analysis study performed under non-experimental conditions to assess the effects of certain clinical parameters on bond strength of adhesives. Potential papers were selected from articles published in 13 peer-reviewed journals using "PubMed data base". American Journal of Dentistry, Journal of Adhesive Dentistry, British Dental Journal, Dental Materials, European Journal of Oral Science, International Dental Journal, Journal of Dentistry, Journal of Dental Research, Journal of Oral Rehabilitation, Journal of Prosthetic Dentistry, Operative Dentistry, Quintessence International and Journal of Conservative Dentistry. Paper published in English or translated to English. Only studies measuring the bond strength of one-step and two-step self-etch dentin-bonding agents to be included. The bonding agents that are commercially available and tested by shear or tensile mode on sound dentin from permanent teeth. Dentin-bonding agents involved in the analysis should have been tested in at least five different studies. The outcome measure had to be the dentin bond strength expressed in MPa/Psi. Among the selected studies, some exclusion criteria applied. Paper displaying only graphic data. We classified the parameters into four groups: Group A - Factors related to the dentin substrate; Group B - Type of composite and dentin-bonding agents; Group C - Bonding area and; Group D - Thermocycling and testing mode . All the selected article were summarized in [Table 1] according to the commercial products. The problem of bond-strength testing is that the materials were seldom compared with a standard. Rather, different materials were tested under various conditions and bond strengths are reported as point estimates and expressed in MPa. It is difficult to compute a standard effect size for each study, as required in a classic meta-analysis. Thus, we decided to analyze directly the measures of bond strength from reports published in literature. This quantitative overview was performed in non-experimental conditions since materials and conditions are not allocated randomly. From each report means and standard deviations of bond strengths were extracted and tabulated with corresponding experimental conditions. The Statistical Analysis Software System MIX 2.0 Professional (Biostat, Englewood, NJ) was used to perform the statistical analysis. Differences between means were computed with analysis of variance. [Table 2] and [Table 3] show descriptive statistics of different parameters tabulated from the selected studies according to the four groups described in materials and methods section. Some parameters, such as tooth storage medium and dentin surface topography, were not included in the statistical analysis, due to their greater variability or lack of information. It was noted that about one-third of the selected articles provided such information and that the distinction between the different failure modes was not always available and clearly identified. For this reason, both composite and dentin cohesive failures were grouped together. One-way ANOVA comparison between one-step and two-step self-etch adhesives is given in [Table 4] The P-values indicate the potential relation between each parameter and the bond strength. Their respective influences were given by the P-value at the significance level of 0.05(a). 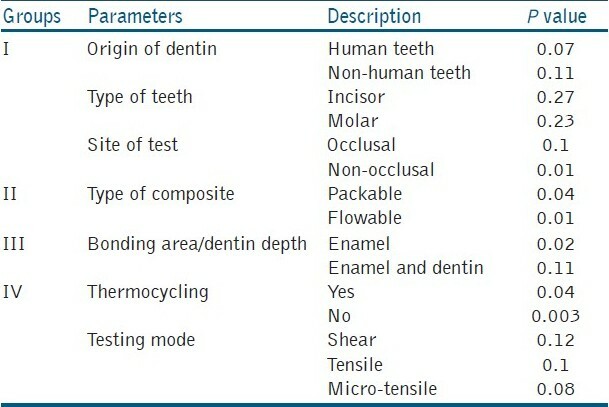 All the studied parameters showed no significant difference, except for dentin origin/site and bonding area. In addition, statistical analysis done with ANOVA showed statistical significance between the one-step and two-step self-etch adhesives. Our analysis revealed that the origin of dentin, site of bonding and bonding area had significant influence on bond strength of one-step and two-step self-etch adhesive. The studies have also showed that there is a difference in bond strength between human teeth and bovine teeth. This difference explains the fact that dentinal tubules are large in the coronal portion of bovine dentin, but one study by Nakamichi et al, showed that there is no difference in bond strength between bovine and human dentin when only the superficial layers was used. Studies also showed that the bond strength varied between buccal and occlusal surfaces. Oilo and Olsson  showed that the tensile strength is higher on the buccal surface compared to the occlusal surface, which could be explained by the fact that the tubules are lower in number with less area percentage on the buccal surface than on the occlusal surface. Surface area significantly affects the bond strength in one-step and two-step self-etch adhesives. Bond strength is calculated as the load at failure divided by the cross-sectional area of the bonded surface. An inverse relationship between bond strength and bonded surface area has been recently shown,  confirming previous studies. These authors explain the lower strengths of large bonded samples by the greater number of defects within the adhesive joint. From this meta-analysis study, we have analyzed that two-step self-etch adhesive showed better bonding ability than one-step self-etch adhesives. Thereby, several clinical parameters among which dentin origin, site and area of bonding have shown a significant influence on mean bond strength of adhesive system. Thus, our study suggests, that the practitioners can easily control these parameters by using standardized protocol for the clinical success of self-etch adhesive systems. 1. Finger WJ. Dentin bonding agents. Relevance of in vitro investigations. Am J Dent 1988;1:184-8. 3. Van Noort R. Clinical relevance of laboratory studies on dental materials: Strength determination-a personal view. J Dent 1994;22:S4-8. 4. Fowler CS, Swartz ML, Moore BK, Rhodes BF. Influence of selected variables on adhesion testing. Dent Mater 1992;8:265-9. 5. Goodis HE, Marshall GW Jr, White JM, Gee L, Hornberger B, Marshall SJ. Storage effects on dentin permeability and shear bond strengths. Dental Materials 1993;9:79-84. 6. Prati C, Pashley DH. Dentin wetness, permeability and thickness and bond strength of adhesive systems. Am J Dentistry 1992;5:33-8. 7. Perdigao J, Swift EJ, Cloe BC. Effects of etchants, surface moisture, and resin composite on dentin bond strengths. Am J Dent 1993;6:61-4. 8. Kitasako Y, Burrow MF, Nikaido T, Harada N, Inokoshi S, Yamada T, et al. Shear and tensile bond testing for resin cement evaluation. Dent Mater 1995;11:298-304. 9. Diaz-Arnold AM, Williams VD, Aquilino SA. A review of dentinal bonding in vitro: The substrate. Oper Dent 1990;15:71-5. 10. Lee SY, Greener EH. Effect of excitation energy on dentine bond strength and composite properties. J Dent 1994;22:175-81. 11. Miyazaki M, Hinoura K, Onose H, Moore BK. Influence of light intensity on shear bond strength to dentin. Am J Dent 1995;8:245-8. 12. Burrow MF, Kitasako Y, Thomas CD, Tagami J. Comparison of enamel and dentin microshear bond strengths of a two-step self-etching priming system with five all-in-one systems Oper Dent 2008;33:456-60. 13. Do Amaral RC, Stanislawczuk R, Zander-Grande C, Gagler D, Reis A, Loguercio AD. Bond strength and quality of the hybrid layer of one-step self-etch adhesives applied with agitation on dentin. Oper Dent 2010;35:211-9. 14. Ishikawa A, Shimada Y, Foxton RM, Tagami J.Micro-tensile and micro-shear bond strengths of current self-etch adhesives to enamel and dentin. Am J Dent 2007;20:161-6. 15. Owens BM, Johnson WW. Effect of single step adhesives on the marginal permeability of Class V resin composites. Oper Dent 2007;32:67-72. 16. Perdigão J, Gomes G, Gondo R, Fundingsland JW. In vitro bonding performance of all-in-one adhesives. Part I--microtensile bond strengths. J Adhes Dent 2006;8:367-73. 17. Perdigão J, Dutra-Corrêa M, Castilhos N, Carmo AR, Anauate-Netto C, Cordeiro HJ, et al. One-year clinical performance of self-etch adhesives in posterior restorations. Am J Dent 2007;20:125-33. 18. Perdigão J, Dutra-Corrêa M, Anauate-Netto C, Castilhos N, Carmo AR, Lewgoy HR, et al. Two-year clinical evaluation of self-etching adhesives in posterior restorations. J Adhes Dentistry 2009;11:149-59. 19. Reis AF, Bedran-Russo AK, Giannini M, Pereira PN. Interfacial ultramorphology of single-step adhesives: Nanoleakage as a function of time. J Oral Rehabil 2007;34:213-21. 20. Reis A, Moura K, Pellizzaro A, Dal-Bianco K, de Andrade AM, Loguercio AD. Durability of enamel bonding using one-step self-etch systems on ground and unground enamel. Oper Dent 2009;34:181-91. 21. Reis A, Leite TM, Matte K, Michels R, Amaral RC, Geraldeli S, et al. Improving clinical retention of one-step self-etching adhesive systems with an additional hydrophobic adhesive layer. J Am Dent Assoc 2009;140:877-85. 22. Sarr M, Kane AW, Vreven J, Mine A, Van Landuyt KL, Peumans M, et al. Microtensile bond strength and interfacial characterization of 11 contemporary adhesives bonded to bur-cut dentin. Oper Dent 2010;35:94-104. 23. Salz U, Bock T. Adhesion performance of new hydrolytically stable one-component self-etching enamel/dentin adhesives. J Adhes Dent 2010;12:7-10. 24. Narasimha Bharadwaj, KS Karthikeyhan, VG Sukumaran. Comparative shear bond strength analysis of strong, intermediary strong and mild 'self­ etch' systems, and a hypothesis on their chemical behavior on dentin. J Conservat Dent 2005;8;24-30. 25. DerSimonian R, Laird N. Meta-Analysis in Clinical Trials. Control Clin Trials 1986;7:177-88. 26. Griffith AA. The phenomena of rupture and flow in solids. Philos Trans Royal Soc Lond 1921;221:163-98. 27. van Noort R, Cardew GE, Howard IC, Noroozi S. The effect of local interfacial geometry on the measurements of the tensile bond strength to dentin. J Dent Res 1991;70:889-93. 28. Versluis A, Tantbirojn D, Douglas WH. Why do shear bond tests pull out dentin? J Dent Res 1997;76:1298-307. 29. Tantbirojn D, Cheng YS, Versluis A, Hodges JS, Douglas WH. Nominal shear or fracture mechanics in the assessment of composite-dentin adhesion? J Dent Res 2000;79:41-8. 30. Nakamichi J, Iwaku M, Fusayama T. Bovine teeth as possible substitutes in the adhesion test. J Dent Res 1983;62:1076-81. 31. Oilo G, Olsson S. Tensile bond strength of dentin adhesives: A comparison of materials and methods. Dent Materi 1990;6:138-44. 32. Carvalho RM, Mendonça JS, Santiago SL, Silveira RR, Garcia FC, Tay FR, et al. Effects of HEMA/solvent combinations on bond strength to dentin. J Dent Res 2003;82:597-601. 33. Phrukkanon S, Burrow MF, Tyas MJ. The influence of crosssectional shape and surface area on the microtensile bond test. Dent Mater 1998;14:212-21. 34. Sano H, Shono T, Sonoda H, Takatsu T, Ciucchi B, Carvalho R, et al. Relationship between surface area for adhesion and tensile bond strength-evaluation of a micro-tensile bond test. Dent Mater 1994;10:236-40. 35. Wang Y, Spencer P. Continuing etching of an all-in-one adhesives in wet dentin. J Dent Res 2005;84:350-4. 36. Chopra V, Sharma H, Datta PS. A comparative evaluation of the bonding efficacy of two-step vs all-in-one bonding agents- An, in-vitro study. J Conservat Dent 2009;12:101-4. 37. Burrow MF, Harada N, Kitasako Y, Nikaido T, Tagami J. Seven years dentin bond strength of a total and self etch system. Eur J Oral Sci 2005;113:265-70. 38. Shekhar D. Comparative evaluation of micro-shear bond strength of adhesive resins to coronal dentin versus dentin at floor of pulp chamber - An Invitro Study, J Conservat Dent 2006;9:123-30. 39. Erickson RL, Barkmeier WW, Latta MA. The role of etching in bonding to enamel: A comparison of self-etching and etch-and-rinse adhesive systems, Dent Mater 2009;25:1459-67. 40. Yaseen SM, Subba Reddy VV. Comparative evaluation of shear bond strength of two self-etching adhesives (sixth and seventh generation) on dentin of primary and permanent teeth: An in vitro study. J Indian Soc Pedod Prev Dent 2009;27:33-8. 41. Kimmes NS, Barkmeier WW, Erickson RL, Latta MA. Adhesive bond strengths to enamel and dentin using recommended and extended treatment times. Oper Dent 2010;35:112-9. 42. Gianini RJ, do Amaral FL, Flório FM, Basting RT. Microtensile bond strength of etch-and-rinse and self-etch adhesive systems to demineralized dentin after the use of a papain-based chemomechanical method. Am J Dent 2010;23:23-8. 43. Lee JI, Park SH. The effect of three variables on shear bond strength when luting a resin inlay to dentin. Oper Dent 2009;34:288-92. 44. Britta LC, Martins M, França FM. Influence of different primer application times on bond strength of self-etching adhesive systems to unground enamel. Oper Dent 2009;34:43-50.